"On release days, we're watching the Reddit threads, we're looking for people to get really excited for our stuff"
One struggle the two come across that's unique to MMOs is the need to ensure the player feels they are at the center of the story, while also having that story make sense for everyone else in the world at the same time. That problem complicates further in a game with increasingly large amounts of content - one player might see a very small portion from one point in time, while another may see every little bit they can. "I'm sure that plenty of other people who have written for MMOs can attest to the same thing, but there's a constant tension in them. You have this expansive world with a ton of players in it who are all experiencing this story that they are at the center of, and we're making sure that every single individual player is having a really great narrative experience, but they're running around having it with dozens of their friends. "Finding a way to maximize the storytelling potential that we have in that context is always a challenge. We want to make sure people are intellectually and emotionally engaged with the content they're consuming and the tasks that they're performing, while also having opportunities to do all this stuff with their friends and create their own stories in that space. Making space for that, for players who want to do those things." 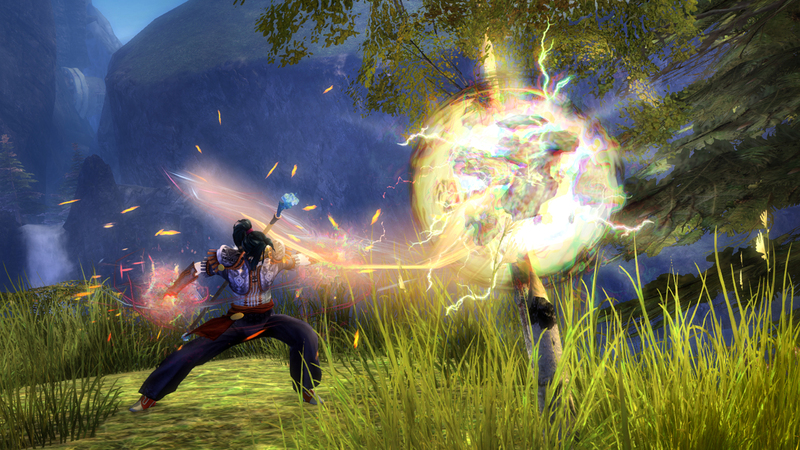 Guild Wars 2, at least for now, seems to have overcome a struggle many newer MMOs have post-World of Warcraft. The game celebrated over 11 million players (total, not active) this time last year, and doesn't seem to be showing signs of flagging. But despite a number of major differences between it and Blizzard's MMO, any longform story can look to World of Warcraft's struggles with narrative over the years to see one possible future for themselves. Linde and Kain are very aware of the troubles of trying to sustain a story over the years as more and more content gets stacked on top. But they hope to head it off in the case of Guild Wars 2 by relying on strong character writing. "We can get what we want to get across without requiring the player to look at our Wikipedia page"
"We get the whole narrative department together to read our scripts and we offer feedback on things: Is this clear enough? Does this need to be there? Do we actually need this many names and proper nouns and fantasy words in this sentence? No, we probably don't, we can get what we want to get across without requiring the player to look at our Wikipedia page. That helps us focus a lot." "Another thing is if you look at something like Game of Thrones, Game of Thrones has a hugely expansive political backdrop," Linde adds. "It's a really complicated story, right? But at all times it's anchored by the characters and their motivations and what they want. When in doubt, we bank on characters. When in doubt, we make sure that the kind of story we're telling is anchored in really good, character-driven storytelling. "The lore is hugely expansive, and it's intimidating. When I came on board at ArenaNet, I was just like, 'Oh my God, there's so much.' But then I realized the lore isn't central to the storytelling. It's the scaffolding that enables the storytelling. It's the material with which we build character stories. It's supplementary, but it's not the focus. And that is part of what makes it so accessible. When you dive in, you're diving into a character-based story. It's okay if you don't know what something is or where a location is. It's fine. You're going to find a story you can relate to and characters you can relate to." "Because it's such a longform story and there's so much to it, we can tell stories for people who understand all our lore, or not a lot of our lore," Kain concludes. "If you didn't play Guild Wars 1, you can look at the characters. If you're intimately familiar with all the details of who the gods are in Guild Wars, there's stuff for you too, there. Maybe there are characters in the open world who are talking about something that you're really only able to get the deeper meaning of if you're familiar with the lore. But if you're not, it's still a good conversation and it still builds on the characters and builds on the situation. That's always the line we're trying to walk when we're building out the world." Linde and Kain tell me that ArenaNet is constantly updating its storytelling technology in a number of ways through its in-house engine, called Duo. Linde says on the backend, things are constantly changing and the team must continually roll with the punches to keep things moving. But on the player side, change can be slower. Kain says it's for good reason. "We're going to tell the best story we can. 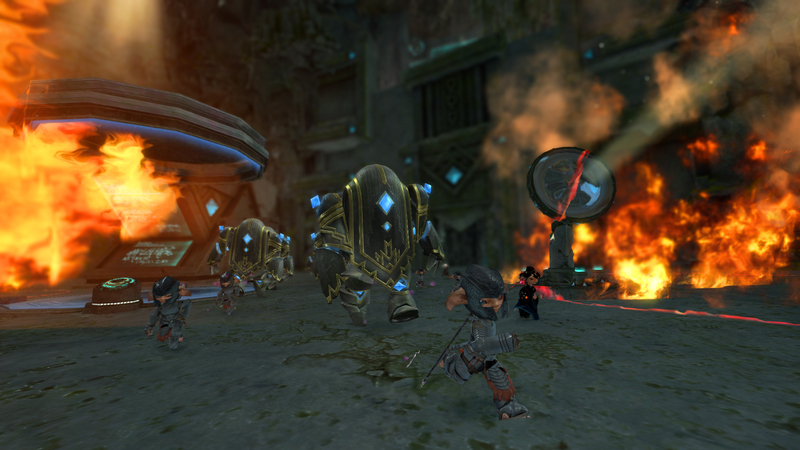 That's topline objective"
"I have to give ArenaNet credit for this," he says. "If a new game comes out and it has something really cool in it, we don't immediately go, 'We need that cool thing in our game.' There is always a discussion about how this improves the user experience, how it improves the game for players. So when we added mounts in Path of Fire, that was a thing that was a massive discussion on, well mounts just shouldn't let you run faster. That's not how we do things. That's not how the design process works. The designers spent countless hours figuring out freedom of movement, how they were going to work that into the core experience. So the mounts in Guild Wars 2 all have a very specific gameplay function that is pretty unique to something like Path of Fire, and now we use that going forward. "Adding new features is something ArenaNet takes very seriously, and working it into the core narrative and making sure we're not just putting stuff in for the sake of it. It's always an additive experience." Kain also says that character-driven storytelling is a major priority for everyone at ArenaNet, no matter their job in the company. "We have designers and artists who are also very good at telling stories in their own right, they just use their own tools to do it. Designers tell story through gameplay, artists tell story through the environment and things that you see. And we tell stories with characters, and we all come together to tell these more interesting stories using our own toolsets. That comes together to create an interesting longform experience." Linde adds that he feels this prioritization sets ArenaNet apart. "Designers, audio people, our cinematic artists, everybody wants to tell the best possible story and everyone is invested in that story," he says. "Unlike other studios, where you might have to sell people on the importance of story as opposed to a pure gameplay experience, we never have that discussion at ArenaNet. We're going to tell the best story we can. That's topline objective."